It's almost Memorial Day weekend here in NYC and the city is buzzing with eager vacationers. A year ago today I was steaming my Greek goddess dresses to roll into my carry on luggage onwards to Athens, Greece. Under any other circumstances, typically I would be throwing my dirty laundry into a luggage right now, preparing to head home to Toronto. But this year is different. I'm doing the inverse. I'm planning my very own Manhattan stay-cation, because secretly the city is far more tolerable without half of its occupants! Also, a little less secretly, I have been working like a maniac from morning to night these past few weeks on new illustrations, collaborations, commissions, connections and I'm quite simply EXHAUSTED! When it comes to the young entrepreneur life, you name it, I'm doing it. I don't think I've worked this hard...ever! So a stay-cation might seem a little lacklustre to most but I actually can't think of anything better than just staying put and channeling the inimitable city cool of Aussie bombshell Zanita (illustrated above). What I hope more than anything is that all this hard work pays off, that the bags under my eyes were a very small price to pay for the reward. I know they say that in life you need balance, but how does anyone ever get ahead taking things in stride? Maybe the joke is on me. I guess you can only ever just live for you, the way you want to, for the things you dream of. I'm excited to share what is coming down the pipeline with you all and just hope that there is still so much more to come. Until then, it's time to give these swollen eyes a rest! Really cute illustrations! I am also from New York City! That storm over night was horrible right? The lightning was terrifying! 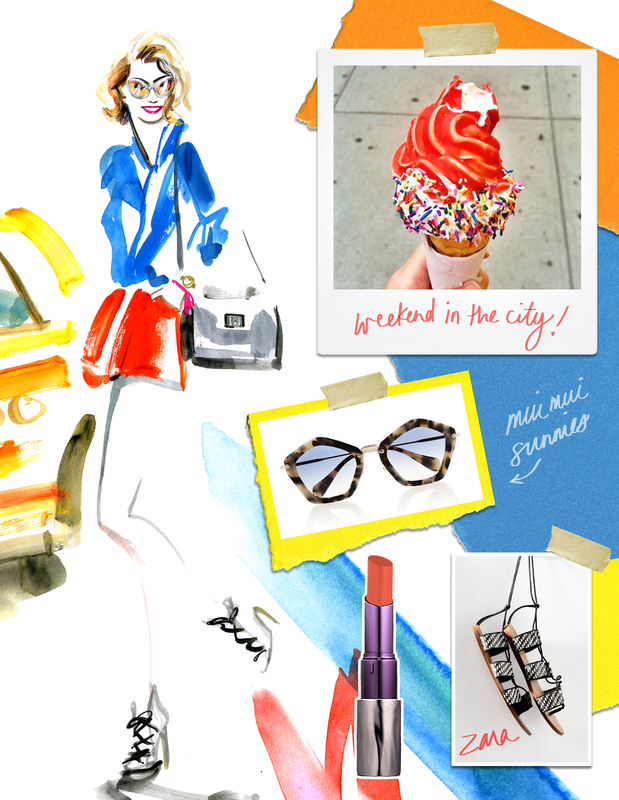 I think the collage captures the start of summer in the city perfectly. Staycations are awesome! Enjoy yours! I love your illustrations. That ice cream cone one is divine. Wow! You have big talent!! <3 Great blog! Staycations are sometimes the best! Relaxing is key to success sometimes! I know all you're hard work is going to pay off!! You're amazing!! !